The Bible begins with the account of creation, how God made something out of nothing. It wasn’t just any old thing. He created land, water, vegetation, animals, people. After each day of creative fun, He saw that it was good. Every year, around the world, there’s a little something called Earth Day. It’s an excellent opportunity to really pause and appreciate God’s creation, because after all, it is good, really, really good. Check out ten easy ways to appreciate God’s creation this Earth Day (or any day!) together as a family! 1. Recycle or pick up trash. Recycling is part of taking care of this beautiful world we live in. It’s not common in the part of South Africa I live in. However, there’s plenty of opportunity to teach about picking up trash and keeping our world clean. 2. Repurpose! Recently my son and I made a shoe rack entirely out of materials we had or got from the Earth. So much satisfaction is had when we make something great without paying a cent. 3. Compost. We eat a lot of fruits and veggies and therefore have a lot of fruit and vegetable peels. Starting a compost pile is a great way to reuse that precious goodness. 4. Plant a fruit tree. We recently planted fruit trees and turned it into an act of intercession, praying for God’s fruitfulness to abound in our lives, in our ministry, and beyond. 5. Admire the beauty of His creation by taking photos. One of my favorite Earth Day activities was the year I handed each of my kids a camera, and we went outside and photographed what we saw. They captured such detail, because they were looking for it. It was an excellent way to pause and look. 6. Make it educational. God is very clever. The way He designed the Earth is just amazing. Talk to your kids about how things work together, bees and flowers, for example. It shows God’s attention to detail and His good plan for all of creation. 7. Read a devotional book together. God’s word is full of stories of His good creation. I can think of no better place to start than with the family who seems to always be out in God’s creation, the Duck Dynasty gang! Their new devotional book, Duck Commander Devotions For Kids, is full of stories, Scripture, prayers, and action steps. It even incorporates that great personal flair we’ve come to love with each character. 8. Plant a garden. My daughter has tomatoes growing in a small container in our backyard. She is so proud of those tomatoes. She’s learning responsibility as she waters them and also how dirt, seed, and water work together to grow something we can eat! 9. Get OUTSIDE! What better way to appreciate creation than to be in it. Go on a hike. Explore a new park. Go to the zoo. There’s creative goodness everywhere. 10. Draw God’s beauty. One day I found my son outside with a pad of paper, a pencil, and the beginning of an excellent drawing of a papaya tree. Drawing is a great way to notice things and appreciate God’s attention to detail. 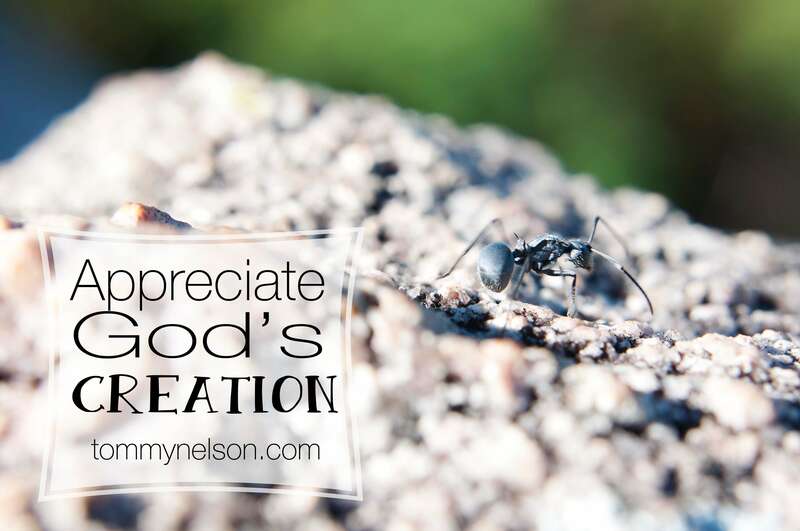 What ways do you and your kids take time to appreciate God’s creation? This entry was posted in Blog, Tommy Nelson and tagged 9780718022495, Appreciate God's Creation, Creation, Duck Commander Devotions For Kids, Duck Dynasty, Earth Day, Genesis 1:31, Jen Price, Tommy Nelson by Jennifer Price. Bookmark the permalink.